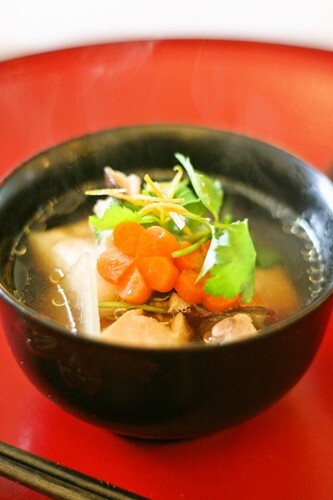 “Ozouni” is the traditional Japanese mochi soup for New Year’s. There are many regional versions of “Ozouni” in Japan and the flavors vary greatly so it is always important to indicate where the “Ozouni” comes from. Some are soy sauce based, some are sweet miso flavor, some uses fish broth, some uses kelp broth, and some uses chicken broth. 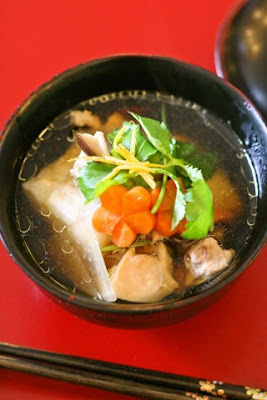 Within the soup are veggies and meat, which also vary, as does the shape of the mochi itself. Even with Tokyo style “Ozouni” there are some variations depending on your family. Therefore I will call my “Ozouni” Tokyo style Sullivan Ozouni! 1. Cut the chicken thighs into small bite size pieces. Cut daikon into quarter rounds and ¼ inch thick. Cut the carrots into round ¼ inch thick slices. Cut shiitake into thin slices, about 10 slices per inch. 2. Combine cut boneless chicken thighs and broth in a pot and heat to a boil. 3. 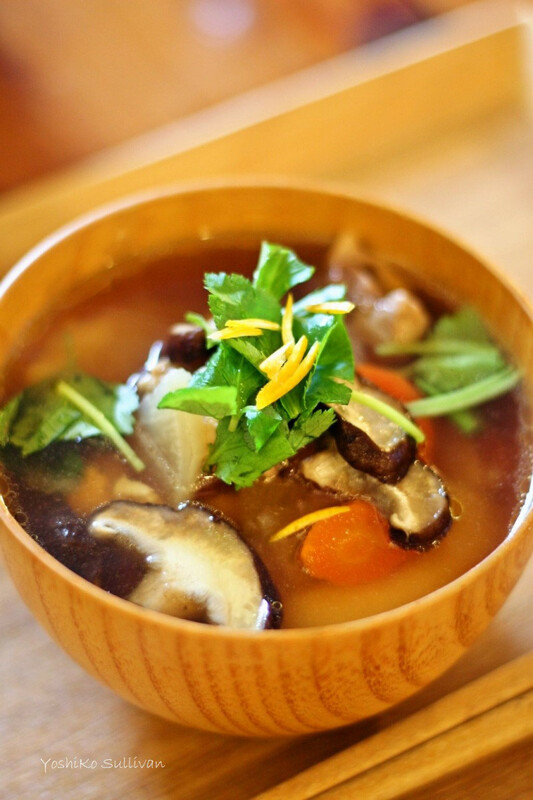 Add daikon radish, carrots and shiitake mushrooms, and simmer until the vegetables turn soft. 4. Add sake, light-colored soy sauce, mirin, and kosher salt and simmer on low heat to allow the taste of the broth soak into the vegetables. 5. 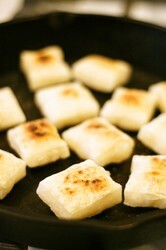 Grill the mochi in a pan or broil them in the oven until puffy and slightly browned. 6. Put some broth in the bowl first before adding the mochi. Then add the mochi to the individual bowls. This will help to prevent the mochi from sticking to the bowl. Then finish serving the soup with veggies and meat over the mochi. Garnish with mitsuba parsley and/or yuzu peel.